before she even arrived though, not at all. child-rearing department as I ought to be. Arts and crafts time? Daily schedules? years into motherhood and I still don’t have a handle on those things. I wished that, unlike me, she be more assertive. curly hair)…an inordinate love for pasta (and pretty much all carbohydrates). to the hot oil and sauté until the onion is soft and translucent. stirring, until bacon strips are cook and some of the fat is rendered. Don’t let it get too toasty. mixture gets too dry add another spoonful of water. looks to dry, add the rest of the cream. immediately with some freshly grated Parmesan on the side. Serves two. nutmeg, but you can also add some smoked paprika or cayenne for a bit of heat. papa though, football and all manners of ball throwing/kicking action. And anyway, we’ll always have pasta! Ohhhh I love pasta too! One of my all time favorite comfort food 🙂 I don't know who I take after though. Coincidentally, I had a big plateful of Aglio Olio pasta this morning! Ha! Scrumptious! This is a heavenly combination (one of my favorite). Joey – don't sweat the small stuff. What you're doing with her will stand her in good stead for her life. This looks delicious! Loooove mushrooms and bacon, and who doesn't love pasta?! What a great idea for pasta! I have all the ingredients right here and must try this for the weekend. Thanks for sharing & love your story, Joey! That looks delicious. And sinful. Hi Karen! Thanks for the compliment 😉 She has a bit of me and a bit on my husband…but a lot all her own! Hi Ling! Thanks for the vote of confidence! Hi BettyAnn! Hope you like it! Hi Midge! The days just fly past!! What a cute little girl you have! This dish sounds very good and comforting. Oh Joey, do not let the parenting stuff get to you…you are doing a wonderful job! There are no hard and fast rules on "the right way" to rear a child. We just do the best we can! No parent is perfect – and believe you me, not every parent lives up to their parenting plan! Some are just all about the image of being a good parent…That said, I too, love my pasta / carbs! This, to me, is a perfect meal…ahhh…bavon, mushrooms, and cream, OH MY! Your little Carmen is so adorable ( I saw a photo of her with you somewhere, glossy something…). I'm glad you got what you wished for. Cream, bacon, and pasta…can't go wrong with that. Looks good and I am sure that is tastes wonderful. Glad you and your daughter can bond over food. My favorite flavor – Bacon! Combine it with cream, pasta and mushrooms…wow, a real winner. Thanks for sharing! Ahh i think I'm going for a simple menu for Noche Buena this year. starting with this one. Yummmmm! 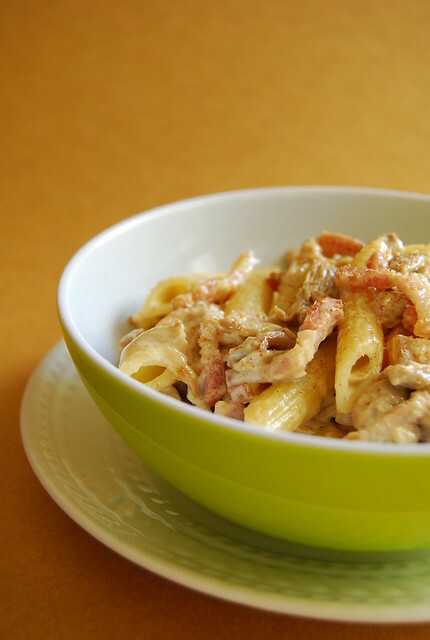 This creamy mushroom and bacon pasta recipe looks very delicious. I'm gonna add some cooked peas, as you say, to add more nutrition. Hi Jen! Yes, we are all doing the best we can…I agree 🙂 And for the most part it's a wonderful adventure! Hi Fork and Whisk! I love this combination 🙂 And bonding over food! Hi Faye! Hope you like it! I'm going to try this this weekend. With such few ingredients this could not be simpler and by the looks of it this is gonna be wonderfully flavorful. I'm sure to add this to my list of wonderful recipes.